So here is the finished article, with all the details added, cleaned up and ready for painting. All I need to do now is find a suitable primer, normally Halfords' works for me, but I am not sure it is best for brass? Assembly has used a mixture of methods. I have soldered where I could - for example the bonnet assembly, sand pipes, lifting rings, driver's seat and sanding levers. However the mass of the footplate assembly has made soldering practically impossible for my 25W iron, and also I didn't want other parts coming un-soldered while I soldered new ones on! So most of the details have stuck in place with superglue or epoxy. The gearstick used a pin from the wife's sewing kit, a little filing made the head more rounded. This seemed easier than filing a handrail knob to a ball shape as suggested in the instructions. I hadn't fitted the clutch pedal at the time of the photos, having checked some photos and where the driver's foot will go I can glue it in place before painting. The holes in the buffer beam weights for the couplings can be seen, the buffer/coupler casting has been mounted about 1/2mm high to clear the couplings. The mis-casting of the sideframes has been rectified with a little filler, although from normal angles it was barely visible. Having assembled the frames to the footplate it is time to add the electrical pickups and assemble the chassis. The pickups are made from phosphor bronze wire, and on one side of the chassis block they are soldered directly to the block, thus making the whole loco live. The other side (shown) has the pickups soldered to a small piece of PCB (there is sellotape behind the pickups too, to prevent shorts). This PCB has to be connected to the motor - which is mounted above the footplate - with a piece of fine wire. However that means un-soldering the wire from the motor every time the chassis is removed from the body, making lubrication and cleaning pickups a pain. My solution was to make a brass contact from the PCB on the chassis, which acts on another small PCB contact under the footplate, and that is connected to the motor. Thus electrical contacts between chassis and motor are made as the body is assembled, hopefully the photos make this clear. The underside of the footplate, the PCB contact and black wire to the motor can be seen at the top. The holes under the bufferbeam weights are to locate the microtrains couplers. The sand-pipes have been soldered into the sand boxes. The chassis assembled, the motor will be hidden under the bonnet. The black wire on the near side goes through the footplate to the PCB contact seen above, the bare wire simply connects the motor to the body electrically. Initial running tests revealed a problem, there was a mechanical lurch every inch or so. This was probably a gear mesh issue, but I couldn't fix it. However David Janes at KBScale offered to take a look, and it has just returned working perfectly (that kind of service seems to be typical of Dave). It now runs very smoothly and very, very slowly. The gearing of this model is 196:1 via the double worm drive, meaning the motor is screaming away but the motion of the loco is realistically slow. As well as posting a number of useful pictures, CF sent me this useful link, which includes a copy of the 1933 instruction book. Apparently the top speed of these locos was 5mph! I'm glad I only have a box file, anything larger and that speed could become tedious! Landswood Park was one of the large estates of Cheshire. Home of the Marshall family for several generations, the Hall dates from the 18th century, and makes a grand impression as approached from the surrounding parkland. About half a mile to the South of the Hall lies the Home Farm, one of several farms owned by the estate and closest to the Hall, but Home Farm (also known as Landswood Park Farm) was managed directly rather than being let to tenants. It was predominantly a livestock farm, with pigs, cows (mostly dairy), and chickens, however it also grew vegetables such as potatoes in fair quantities. At some point in the 19th century a hand-worked rail system had been installed in the farmyard for making the job of carting animal feed around the cobbled yard easier, this was considered the height of technology for farmyards at the time! However some of the farmworkers returned from the Great War having seen what railways could do over muddy ground, and wondered if the same technology could be of use in their farm. So the farm manager, Edmund Blackadder (who had reached the rank of Captain on the Western Front) put a proposal to Sir George Marshall, the lord of the manor at that time, who happened to be keen on modern developments, and permission was granted to purchase second-hand 2' gauge track and stock from the war department, including a petrol locomotive. The farm workers laid the track and it was operational by the winter of 1920. Initially the line served the Landswood Park Farm yard with lines into some of the surrounding fields, however by 1922 it had been extended as far as the yard of the nearest Cheshire Lines Committee station, a distance of around 3 miles entirely over Marshall land, other than a road crossing by arrangement with the council. By 1927 it had reached it's full extent, with around 6-7 route miles of permanent track, serving two other farms on the estate, a wood yard in the forest, and a branch to the service yard of the big house to bring in coal and other goods from the station. Temporary tracks were laid into the fields for harvesting the vegetables. Traffic included animal feed from the station to the farm stores, then to the various barns and fields, plus of course mucking out of barns and stables - the contents went to the potato fields. Bagged fertiliser and seeds were also transported. 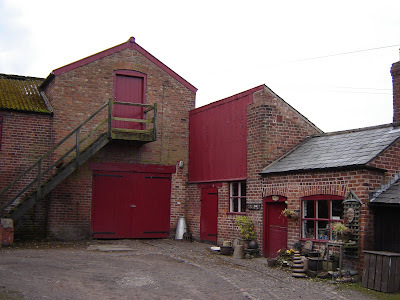 Coal was taken from the station to the Hall, the farm dairy, and for traction engine and domestic use across the estate. Out-bound traffic included potato and other vegetable crops, and timber. Occasionally even livestock (piglets and chickens) were transported, and in later years a pair of wagons were modified to carry fuel for the growing fleet of tractors and lorries. Some wagons were converted to carry passengers, probably labourers for the fields at harvest, but this was of course unofficial! The initial purchase of stock was soon inadequate and worn out. Generally the estate bought off-the-shelf items from Robert Hudson of Leeds, including track parts and wagons, note that 4-wheel wagons seem to have been preferred - possibly due to the tight curves and uneven, lightweight track. Records of the locos used are patchy, and as Sir George and his Farm Manager were canny at persuading potential suppliers to loan locos for trial periods, photographic evidence is confusing. It seems that there were up to 3 or 4 locos at one time, possibly not all in use at once, but we do know that a Lister RT Railtruck was popular for use around the farms due to it's light weight. Trains were generally short as the loco's struggled for traction in places (the track tended to follow the lie of the land! ), so the in-service loco spent all day pottering around the estate. By the mid 1930's the estate was experimenting with tractors and road lorries, and domestic traffic became rare on the line. However WWII and the demand for farm produce kept the line busy, and even as tractors were introduced they didn't replace the railway. Since most goods at that time came via the station the railway was still economic. By the 1950's though most goods were being sent by road lorry, the railway line was worn out and deemed uneconomic because of double-handling, it is believed that it last operated in 1960. The buildings for the box file are surprisingly challenging. They need to give the feel of typical farm buildings, and add visual interest to what is a tiny layout, but also fit inside the box file. However the height inside the box file with the lid shut works out around 10 feet in 7mm scale, which means even a single-storey building with a pitched roof won't fit. That means the buildings will either have to be fully removable, or have removable roofs and upper storeys where present. Here's the first one under construction. I've used Slater's brick embossed plasticard, this is laminated to a 20 thou sheet of plasticard (white) for the door and window frames, then 40 thou plasticard (black) for strength. Further plasticard floors and walls inside reinforce the walls and will hold the building together, this building is "low relief", about an inch deep, but to complicate matters is is not parallel to the back-scene so includes some difficult shapes!. The gable and the roof will lift off - I just need to figure out how to make it do so, while remaining strong! This photo of Tatton Park Farm buildings gives an idea of the type and style of buildings I am trying to portray, although I have designed the buildings to suit their location on the layout. Note the arched windows, the simple window and door frames almost flush to the brick, slate roofs with no barge boards, and the colouring of the local brick. If I can get those details right the buildings should be reminiscent of farms around Cheshire. Sorry about the rather predictable title, but this week I have mostly been building wagons. Here is the total fleet so far, although I do have some more flat wagons and a fuel bowser wagon set to make up. These KBScale wagons are all based on prototypes made by Hudson using the "Rugga" skip chassis. Most industrial lines bought their wagons "off the peg" from Hudson or one of the other manufacturers of similar equipment, rather than have bespoke-design wagons made as many of the better known narrow gauge lines did. The kits are nicely detailed and not at all difficult to assemble, although like any kit they do benefit from a little time and attention. Although I haven't yet made enough couplings, all the wagons are prepared and ready to have them fitted, as previously described. So they are just about ready for painting, but first I will distress the deck of the flat wagon a little, and I need to find a way of making those skip bodies look battered and used. I've heard of people using a blow-torch to soften the thin plastic but even if I had one, I'd be sure to melt or burn the plastic instead! As you can see it will be just right for illuminating the box-file layout. It would be rather over the top to build a lighting rig for such a small layout as I did for Awngate, and rather defeat the point of building it in a box file (just don't ask me what that point is!). However to display a model well requires some lighting, and most desk lamps or clip-on lights don't suit as they would be too close to the model and not give an even light. This long-arm angle-poise type lamp is perfect as it can sit high above the layout and give an even, diffused light from it's 11W fluorescent tube, without blocking the view, and being lightweight and able to fold up small for portability. The light is plenty bright enough, and will give more of a cloudy day look than the warm, sunny-day tungsten strip lights of Awngate or Southon Yard.